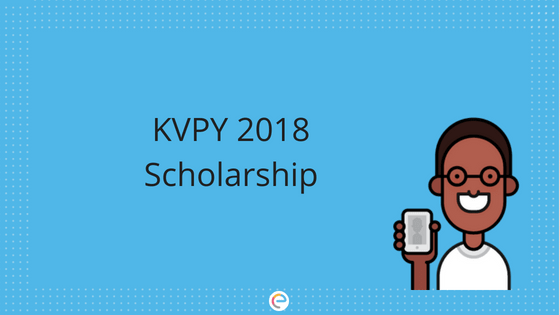 KVPY 2018 | Kishore Vaigyanik Protsahan Yojana is a prestigious and national level scholarship programme which is run by the Indian Institute of Science. Aspirants who qualify KVPY, known as the KVPY fellows, will receive a monthly scholarship up to pre Ph. D. level. KVPY Registration 2018 will be started in the month of July 2018. The KVPY Examination will be conducted in the first week of November 2018. Students who will clear KVPY exam and interview will be eligible for direct admission in top institutes like IISc and the various IISERs. In this article we have provided information regarding KVPY 2018 Eligibility, Application Form & Fee, Exam Pattern, Syllabus, Cut Off and more. Stream SA Candidates have to finish their 10th class with the combination of Science & Mathematics subjects. They have to obtain a minimum of 80% marks and for SC/PWD/ST 70% marks aggregate in the qualifying examination. Should join an undergraduate course in Basic Sciences (B.Sc./B.S./B.Stat./B.Math./Int. M.Sc./M.S.) after class XIIth. Stream SX Candidates have to clear their 10th class with least 80% marks and for SC/PWD/ST 70% in aggregate in Mathematics & Science subjects. Applicants also have to succeed the 10+2 examination with the subject Science & should obtain a minimum of 60% marks and for SC/PWD/ST 50% in aggregate. Stream SB Candidates enrolled in the 1st year of the undergraduate program in Basic Sciences namely Physics/Chemistry/Mathematics & Biology leading to B.Sc./ B.S./B.Stat./ B.Math./Int. M.Sc./M.S. during the academic year in which KVPY is conducted. KVPY 2018 application forms will be available from July 2018. Fee for General Category/OBC: Rs. 1000 +KVAT @ 5.5% = Rs. 1055. Fee for SC/ST/PWD: Rs. 500+KVAT @ 5.5% = Rs. 528. In Part I of both the Stream, 1 mark will be awarded for correct answer & 0.25 marks will be deducted for the incorrect answer. In Part II of Stream SA & SB/SX, for each correct response, two marks will be given to the candidates & 0.5 marks will be deducted for incorrect answer. SB Analytical Skills, Syllabus of class 12th (Physics, Chemistry, Mathematics, Biology). SX Analytical Skills, Syllabus of their respective class. Syllabus of class 12th(Physics, Chemistry, Biology, Mathematics). 1st year of B.Sc. / B.S. / B.Stat. / B.Math. / Int. M.Sc. / M.S. syllabus also applicable. When you prepare for KVPY 2018 Exam, care should be taken that you are moving in the right direction. The more you practice, the fewer errors you make. Attempting KVPY Practice Test Series, based on the pattern of the KVPY Exam should form an integral part of your preparation because it tells you about your level of KVPY exam preparation. Most importantly, it also tells you the areas which need your attention. Revision is the key to remember all that you have studied. KVPY study materials and practice links are given below. The KVPY 2018 Admit Card will be issued by the exam conducting authority through online mode. Aspirants can download the admit card from 15th October 2018. Aspirants will get their KVPY Hall Ticket by entering their login credentials. The admit card contains the name of the candidate, roll number, exam center venue, exam date & time, category, etc. The exam will be conducted in across 54 exam centers pan-India. The interview is primarily conducted to gather additional information on each finalist candidates with regard to their knowledge, abilities, and aptitude etc in the field of science and research. Based on the performance in the aptitude test, short-listed students will be asked to appear for an interview which is the final stage of the selection procedure. Aspirants must prepare few introductory questions as they can be asked to introduce themselves by the jury. The interviews are likely to be held during January 15, 2018 – February 20, 2018. However, the students will be informed about their interview dates, time and venue details. The Fellow continues to study Basic Science courses in school/junior college/university, and maintains a minimum level of academic performance of first class or 60% (50% for SC/ST/PWD) marks in aggregate or equivalent grade points and the students have to necessarily pass all the subjects prescribed for that particular academic year (two semesters in case of semester system) and should have obtained the above-specified percentage of marks. The medium of Question Paper Bilingual- English & Hindi Language. Sections Part I & Part II. There will be four sections in Part I & Part II. Candidates must follow the KVPY 2018 Exam Pattern & Syllabus and plan their KVPY study plan accordingly. It will also be beneficial if they practice and take tests online as the KVPY 2018 is conducted only in the online mode. For any information regarding KVPY 2018 or exams in general, feel free to post your comments in the section below. Watch out for the latest KVPY 2018 updates that we share regularly on Embibe. As per the official eligibility released by KVPY, only students enrolled in the first and second year can apply for this exam.